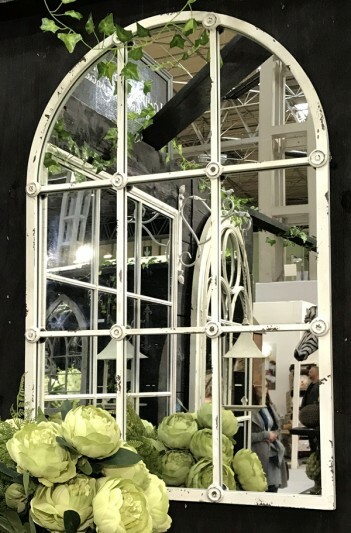 Arch top white metal mirror. Rustic finish. Nice detail on the intersections. Suitable for outdoor use. * The backing is made from waterproof material. * The backing is never sealed. It is always fitted loosely so that water can run through the mirror and not sit there speeding up the rust process. * The metal will rust as you would expect over time – to prevent this, you can to paint the frame with a clear lacquer to prevent the water getting through to the mirror. This should be repeated annually for maximum effect.